If you’re looking for something to do this weekend to celebrate Father’s Day, Cincinnati has plenty of things to keep Dad and the family busy. We’d love to hear how you’ll be spending Father’s Day so leave us a comment and share what you’ll be up to. Take a train ride – You can either head to Lebanon and enjoy a ride on the LM&M Railroad and Journey to Wonderland or if you want to do a little road trip, head to the Whitewater Railroad in Connersville, IN and enjoy a Day Out With Thomas. Train rides all weekend. Car Show – Head up to the Pioneer Village at Caesar Creek State Park near Waynesville, Ohio. June. 19th. Family Fun on Fountain Square – June 19 – read more on Shannan’s post. Go to Family Fun Days from 10am-Noon – great for kids ages 8 and under and then come back for a movie on the square starting around 7pm. Both events are free. Ice Cream Anyone? June 19 – Head to Hyde Park Square for an ice cream social with Graeter’s and enjoy music, arts, kids’ activities, horse carriage rides, vintage cars and bikes. Noon- 5pm. Free. Bett’s House Family Fun Saturday – June 19 – Stop by this historic home and make a craft for Dad. 12:30-5pm. Cincinnati Rollergirls – June 19 – This is great fun for families and it’s the last CRG home game. Civil War Re-Enactors – June 19-20 – Visit Governor Bebb Preserve and see the Pioneer Group in action. ($10/family or $5/person plus you’ll need a MetroParks parking pass). YMCA Open House – June 19 – visit any YMCA in Greater Cincinnati for a fun day of swimming, games, food and more. Inflatable fun – June 20 – Pump-It-Up in West Chester is turning 5 and they are having a free afternoon of fun from 1-4pm. Jump on the inflatables, enjoy some pizza and have fun with Dad. Local playgrounds and parks – Pack a picnic and enjoy the fabulous parks we have in the area – Cincinnati Parks, Hamilton County Parks , Metro Parks of Butler County and many more. Golf – Play some mini-golf with Dad or play a round with Dad at one of the local golf course in the area. 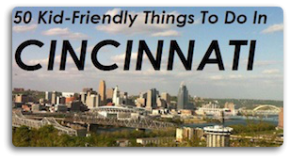 Museums – Visit Cincinnati Museum Center or head up to the National Museum of the United States Air Force for Family Day on June 19 – 10am-3pm, also free. Home bound Fun – Make a t-shirt for Dad (get a solid color t-shirt, some fabric paint and let the kids create). Then, enjoy a grill out, kick back with Dad and spend some quality time together. Music & Concerts – see our post on free summer concerts for a listing of free concerts this weekend. Amusement Park Fun – Coney Island & Kings Island (Joyfest is June 19) – what’s more fun than hanging out with Dad at one of these parks packed with thrills and frills. With so much to do, I hope you’ll find the perfect way to spend Father’s Day. Happy Father’s Day! Of course I have to say Happy Father’s Day to my Dad and to the best husband in the WORLD (ok, just a bit biased)! yօu’rе truly a excellent webmaster. The website loading velocity іs amazing. ӏt қind of feels that you аre doing any distinctive trick. Ӎoreover, Tɦе contents are masterwork. ʏou have performed a fantastic process іn this topic! Great info! How would I be able to leave info about our upcoming events?